How you handle television viewing now may make a measurable difference in how your child will look when she is in her mid-twenties. Kids who watch more than two hours a day between the ages of 5 and 15 will be different from their peers more than ten years later, whether or not they still watch much TV. At age 26 they are more likely to be obese, out of shape, and to already have high cholesterol, according to a study by Robert Hancox and colleagues published in the July 17, 2004 Lancet. Childhood TV viewing affecting adult health? How might this be? Three major ways have been proposed: by replacing hours spent in active play, by slowing kids’ metabolism (especially while they are watching), and by changing kids’ diets. Harvard’s Drs. Ludwig and Gortmaker, in a commentary in the Lancet, explain that of these possibilities, the evidence is strongest for TV viewing harming health through changing the diet. Junk foods may be more convenient to eat while viewing, but the biggest impact on diet comes from the commercials. Enormous amounts of money are spent enticing kids to eat foods that are high in calories, fat, sugar, and chemicals – and low in nutritional value. Each ad that kids see increases the chance that they will want those products, ask their parents for those products, and that their parents will buy those products. There is a direct line between the number of food ads kids see and the number of calories they eat (and how few fruits and vegetables they eat). And food habits that start in childhood affect our tastes as adults. As parents we can reclaim control of our family rooms. 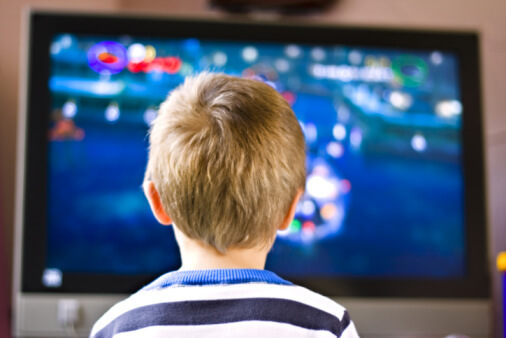 The typical American child spends more than ten times more time watching TV than playing actively. Many kids spend more time watching TV than spent in school and sports combined. We can help our kids forever by helping them get at least an hour of active play every day. We can help them forever by limiting time spent in front of a screen. And perhaps most importantly, we can help them by damming the flood of advertisements.